Welcome to the Floridian Hotel your ideal choice for an Orlando suite hotel. The Floridian Hotel and Suites provides lodging in Orlando just minutes away from Universal Studios and Wet and Wild. 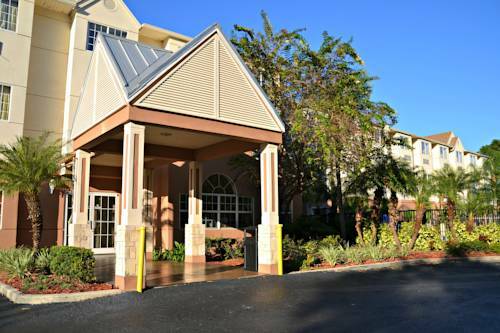 Our property is conveniently located one block east of International Drive just minutes from Universal Studios Sea World Walt Disney World Pirates Dinner Adventure Wonder Works and many other area attractions. If you are here for a convention the Orlando Convention Center is just 1 mile away. We are located within walking distance of some of the best restaurants in Orlando such as The Crab House Ruths Chris Steak House Bahama Breeze TGI Friday*s and the biggest McDonalds in America - just to name a few In the mood for a movie. The brand new Regal Cinemas Pointe Orlando Stadium 20 plus IMAX is located only 1 mile from the hotel. Enjoy one of our beautiful standard or suite rooms which are meticulously kept by our dedicated staff. Swim in our beautiful outdoor pool. Relax with a great cup of coffee available 24 hours in our hotel lobby. Enjoy our complimentary Continental Breakfast offered daily from 630am-930am. For your convenience we also offer free wireless hi-speed Internet access. At the Floridian Hotel our guests are our 1 priority. Exceeding your expectations is our goal every time.